EQ Investors (EQ) today unveiled its new client portal that gives investors a self-service environment with anytime access to portfolio and performance information. The portal provides clients with a clear view of all their investments in one place, both for EQ funds and those held elsewhere. The new portal is part of EQ’s on-going programme to continually improve its services to support clients. Context-sensitive charts and graphs provide a graphical view of investment information with full insight into holdings, pricing data, market value and transactions all available. 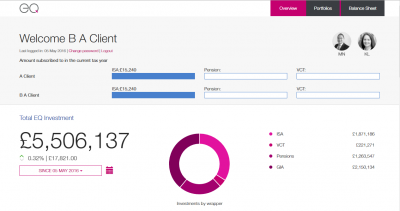 In addition to ISA and pension holdings, the portal provides details on alternative investments such as VCTs and EIS’s. Client balance sheet incorporating assets and liabilities. John Spiers, CEO at EQ Investors, said: “Despite the ridiculous amounts of money spent on platform technology over the last few years, investors still struggle to see a holistic view of all their investments in one place. The portal was developed in conjunction with the digital user experience experts at Radical Company. The portal is currently available to EQ’s Bespoke clients and will be rolled out to the rest of the firm’s clients in the Autumn. You can view the new portal here.